Compatibility: Requires iOS 10.13.6 or later. Designed for video editors, Motion is a powerful motion graphics tool that makes it easy to create cinematic 2D and 3D titles, fluid transitions, and realistic effects in real time. 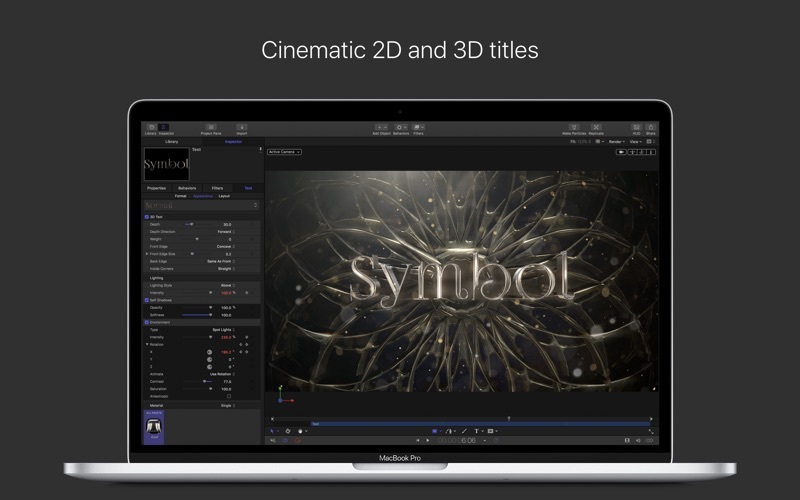 2D and 3D Titles • Import 360° media and design 360° titles, generators, and effects • Build 3D titles from scratch, design them with easy-to-use templates, or instantly convert any existing 2D title to 3D • Easily create beautiful titles that you can animate using more than 100 drag-and-drop behaviors and intuitive text animation tools • Customize 3D titles to create endless looks with over 90 Apple-designed 3D materials including various metal, wood, and stone surfaces • Vector-based characters scale, skew, and rotate with pristine sharpness, while the modern engine in Motion lets you design in real-time Motion Graphics for Final Cut Pro • Save any title, effect, transition or generator and access it directly in Final Cut Pro • Customize Final Cut Pro titles, effects, and transitions by opening them in Motion • Create Smart Motion Templates with any combination of single parameters and rigs, which let you control a group of parameters with a simple slider, pop-up menu, or checkbox in Final Cut Pro • Save any 360° motion graphic and access it immediately from the effects browser in Final Cut Pro Stunning Effects • Choose from more than 230 behaviors for natural-looking motion without keyframes • Use advanced color grading filters like the color wheels, color curves and hue/saturation curves • Track a moving object in a video clip with the point tracking and match move feature • Create an accurate chroma key in a single step with the Keying filter • Use SmoothCam to eliminate camera jitters and image stabilization to smooth bumpy shots • Create your own paintbrushes and 3D strokes or use one of 140 brush presets • Design your own particle emitters or choose from 200 presets for real-world effects such as smoke and sparkles • Choose a circle or rectangle mask or use the bezier and freehand mask tools to quickly draw and adjust control points for rotoscoping • Use the intuitive keyframe tools in Motion for precise control of the timing and position in your animation • Apply 360° effects including blurs, glows, and more • Add the Tiny Planet filter when adding 360º video to a non-360° project to create interesting spherical looks • Harness a thriving ecosystem of third-party FxPlug plug-ins with custom interfaces for tasks like advanced tracking, advanced motion graphics, and more Effortless 3D • Transition from 2D to 3D space by adding cameras • Create 3D scenes within a 360° project for ultra-realistic 360° environments • Set up realistic shadows that animate dynamically with the movement of cameras and lights • Track objects or groups of objects with drag-and-drop ease by applying the Camera Framing behavior • Selectively define focus as an object moves in 3D space • Turn any shape, video plane, or paint stroke into a reflective surface in 3D space Breakthrough Speed, Quality, and Output • Import wide color images, view them on supported Mac computers, and then export in standard Rec. 709 or wide Rec. 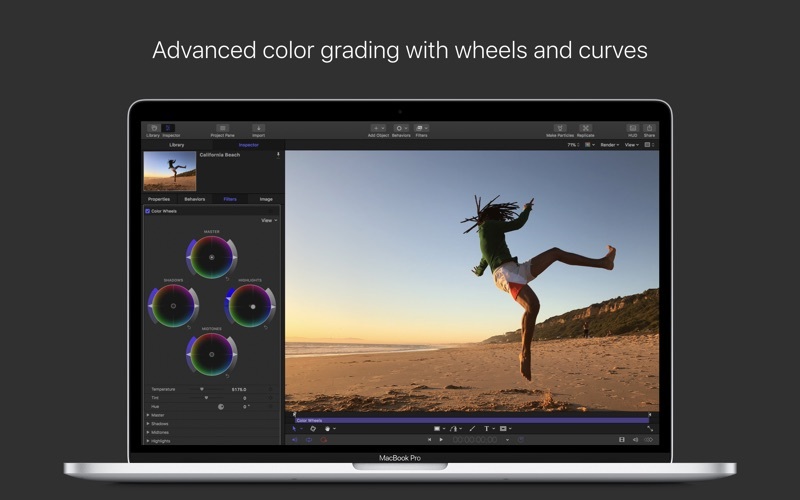 2020 color space • Export standard or 360° projects to Apple devices and publish directly to YouTube and Vimeo • Send to Compressor to access advanced options for custom encoding like HEVC System Requirements: macOS 10.13.6 or later, 4GB of RAM (8GB recommended for 4K editing, 3D titles, and 360° video editing), OpenCL-capable GPU graphics card or Intel HD Graphics 3000 or later, 256MB of VRAM (1GB recommended for 4K editing, 3D titles, and 360° video editing), 4.7GB of available disk space (3.5GB app, 1.2GB supplemental content). Some features require Internet access; fees may apply. Blu-ray recorder required for burning Blu-ray discs. Video output to VR headset requires Mac computer with discrete graphics running macOS High Sierra. 27-inch iMac with Radeon Pro 580 graphics recommended. 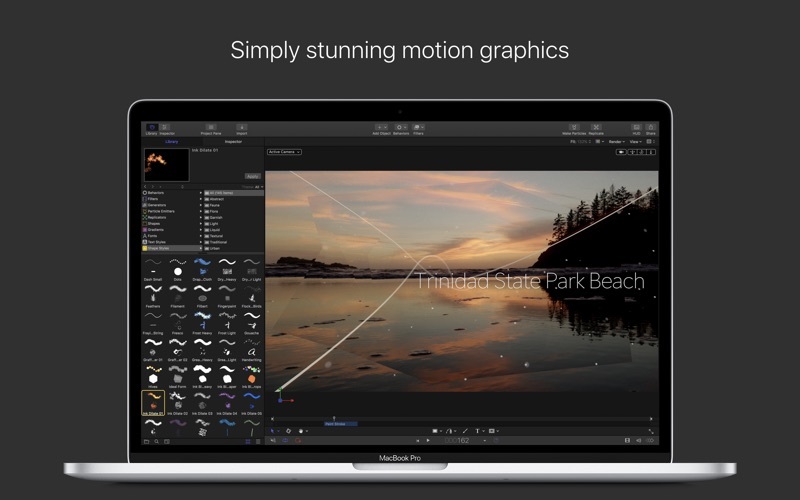 Great motion graphics app - everything is real time, the interface is native and fast. In theory this would be a great product. Unfortunately motion curves are often calculated incorrectly or get stuck. The layer folder structure is designed in a way that makes it really hard to navigate. Other products are much easier to use. Crashes everytime at launch on Mojave. Just wasted $50. Every time I try to save work, the application crashes. I’m on High Sierra 10.13.6 with a Mid 2010 Mac Pro 6-Core 2.66 and 16GB of RAM. I need to update files and find myself unable to do so. I can’t seem to find a workaround. 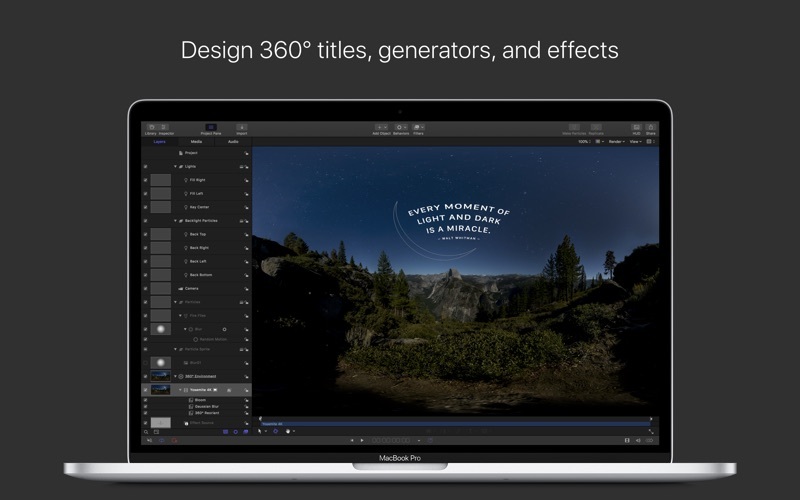 It's a powerful program but it isn't well integrated with Final Cut or Logic. I wish the three programs were better integrated. It would greatly improve the power of the suite. 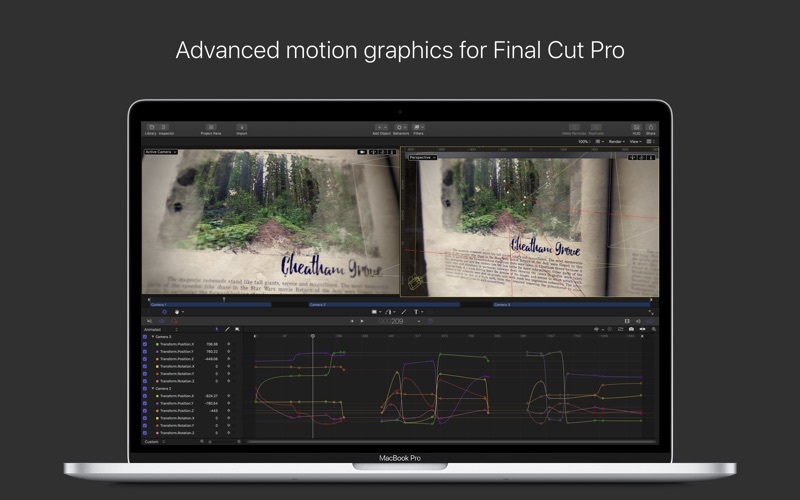 I use it without Final Cut. It can make some neat lyric videos and other cool standalone projects :) Fun to play with. Lots of particles, replicators, and animations. Easy to learn. Doesn’t get the recognition it deserves! Motion rocks! Having previously messed around with After Effects and being overwhelmed, I began to dabble with Apple Motion. Color me impressed. Very easy to use, and the results are amazing. The more and more that I use it, the more I like it. Give it a shot, I think youll be pleasently surprised at what its capable of and what you can create with it.